America is amid a period of intense stress on its political and governmental values and institutions. Two of the leading candidates for President in the last election said our politics was “rigged,” and one of them won. A recent poll by the Democracy Fund Voter Study Group found that nearly 30% of Americans would prefer government “with a strong leader who doesn’t have to bother with Congress and elections” or even “army rule” to our current constitutional democracy. For those of us who regard freedom and democracy as the cornerstones of American identity this is alarming. To heal our body politic and restore faith in our democracy, we need a new civic ethos or governing framework that doesn’t revolve around the largely homogenous society with uniform beliefs that emerged post-World War II, To provide better governance and reinforce the appeal and practicality of our democratic processes, America must replace its increasingly obsolete New Deal civic ethos with one that better reflects the times in which we now live. The current deadlock in Washington, a major source of the growing disillusion with democracy, reflects the difficulty of forging broad national policy majorities in a nation characterized by extraordinary cultural, demographic, generational, racial and ethnic differences. Some say the only way to make America work again is through leadership that “brings us together” by reestablishing greater cultural and lifestyle conformity. We disagree and see an ever more varied nation as the product of freedom, choice, and dynamism. Instead, we propose an innovative approach which we call Constitutional Localism. It is built on a civic ethos that intentionally shifts the greatest possible number of public decisions out of Washington and the state capitals to the community level, albeit within a clear Constitutional framework that protects the individual freedoms and rights won over the last 250 years. Of course, certain responsibilities, such as enforcing and interpreting the Constitution, conducting foreign relations, providing national security, monetary and fiscal policy, and regulating inter-state commerce must remain at the assigned federal level. States also retain critical responsibilities under their own constitutions and must deal with some issues on a multi-community basis. But, Constitutional Localism argues for a system which prefers that decision making be as close to the citizens as possible. That is where consensus and effective solutions are most likely to emerge. Already there is growing evidence that America’s diverse local communities are successfully displacing states as the new “laboratories of democracy,” by finding their own innovative solutions to problems. Their smaller scale and generally greater cultural, ethnic, and economic homogeneity make it easier to achieve consensus and find solutions to challenges that elude effective response in Washington and state capitals. Issues related to the environment, economic development, education, the social safety net, crime and health care are being crafted at the local level, with much less controversy and contention than attempts to address the same problems at the federal level. Both economic and social innovations are taking root more readily in localities than at more distant and bureaucratic levels of government. We believe intentionally supporting a systematic shift of governance from the federal and state levels down to communities offers two benefits. In the near term, moving key public decisions to local venues with greater cultural and political homogeneity and smaller scale will result in more successful public responses to citizens’ needs that will improve lives. In the longer term, effective local democratic decision-making will provide the successful governing experiences needed to rebuild the country’s belief in democratic decision-making. This is a critical formula for democratically governing a vast nation with a highly fragmented set of cultural values and lifestyle preferences. Maintaining the “Constitutional” part of Constitutional Localism is critical to its success. Increased local preferences must not be allowed to risk the divisions that would arise from any attempt to undo the historical consensus on individual and civil rights the country has struggled to achieve for 250 years. A bias towards local action cannot be an invitation to individual communities for selective secession from the Constitution. For the shifting of certain public decisions to the local level to work, it must build upon the expansion of rights that so many have fought for in a way that aligns with our Constitution and Bill of Rights. For this reason, we call our proposed new civic ethos Constitutional Localism and believe it is the right way to preserve American democracy in these trying times. We believe—and history seems to demonstrate—that America periodically needs a new civic ethos to move forward. We believe this is one of those times, and that Constitutional Localism offers the best path to heal American democracy and preserve it for future generations. 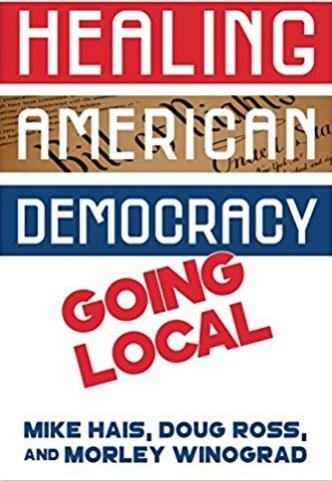 Mike Hais, Doug Ross, and Morley Winograd are co-authors of a new book, Healing American Democracy: Going Local, which you find on Amazon.